This book teaches how to make garments that fit plus-sized bodies. It assumes that you have sufficient sewing skill to construct a garment from an ordinary commercial pattern, then describes how to up-size too-small patterns to fit a larger frame. This book provides instructions on how to adjust sewing patterns to fit larger bodies than those they were designed for. Although its focus is everyday fashion, the information applies equally well to making belly dancing costumes. It assumes that you have sufficient sewing skill to construct a garment from an ordinary commercial pattern, then describes how to up-size too-small patterns to fit a larger frame. The author identifies several body shapes associated with plus sizes, then throughout the book she covers the particular fitting challenges of each and how to address them. The book is packed with practical, matter-of-fact advice. It closes with a section on how to find someone who can do custom sewing for you. The book opens with a chapter that exposes why the ready-to-wear garment industry is so frustrating for many of us. It reveals how clothes are designed and sized, which explains a lot about why I've been so unhappy with the clothes in malls over the years! From there, it moves on to discussing style and offering recommendations for design details that would be flattering to plus-sized figures. 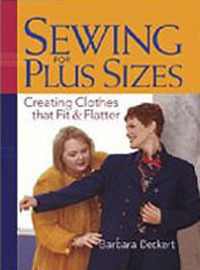 Following these introductory chapters, the rest of the book goes into the details of sewing: tools to make the job easier, tips on choosing fabric, advice on altering a commercial pattern to fit your body size and shape, design modifications to adapt basic patterns to be more flattering, and how to do a fitting. There are two entire chapters devoted to describing how to convert a too-small pattern to one that's big enough to fit a larger size. Every woman who has ever been frustrated by shopping for clothes should read chapter one of this book, "Sewing Is the Solution", because it explains just exactly why the ready-to-wear garment industry is failing to meet our needs, regardless of whether we're plus-sized or not. You sometimes sew garments for plus-sized people, either yourself or others. You don't have much experience in modifying patterns to fit various body types, and you'd like some guidance. You have some experience altering patterns but would like to pick up additional tips on how to do it. You don't have much experience with sewing garments. You're satisfied with costume patterns that come in your size and rarely feel a need to alter anything. I really enjoyed the opening chapter regarding how the garment industry does business, and why that makes it so hard for us to find clothes that fit when we go shopping. I started sewing for myself when I was 13 years old because my it was extremely difficult for me to find clothes that fit. The book offers good advice on how to design flattering garments through choice of fabric, color, and design details such as placement of seams and pockets. Although not all the suggestions would apply to belly dancing costumes, there are many ideas that could be applied to skirts and baladi dresses. The overall tone of the book provides encouragement. Even if you're intimidated by the notion of modiying a pattern, the book emphasizes that it's not so difficult to do this if you know what you're doing, and tells how. The book is packed with many useful illustrations, including both photos and informative drawings. These demonstrate the techniques described in the text, and make the book enjoyable to read. This book could be intimidating if you don't have much experience sewing with commercial patterns. If you're a plus-sized dancer who has ever gazed longingly at patterns for Ghawazee coats, yeleks, evening gowns, or other fitted costume items, then turned away in disappointment because they didn't come in your size, this book will come to your rescue. If you're interested in sewing for other dancers, this book will equip you with the skills to alter patterns to fit them, regardless of whether they are larger than you or smaller. But if you barely know the difference between a needle and a pin, you may first want to learn how to sew garments for non-dance wear from patterns that already come in your size. You need to conquer the fundamental skill of sewing before using this book to learn how to modify patterns. There is nothing to disclose. I have never had any contact with anyone associated with this book.